Hydra Blog Hop ~ Dianne Gardner! Please welcome Hydra author Dianne Gardner to the blog today! She does wonderful art as well as writing – I’d love to know how she does her dragons! Dianne Gardner is both an author and illustrator living the Pacific Northwest. She’s an active member of the Society of Children’s Book Writers and Illustrators, and the National League of American Pen Women. She has written Young Adult Fantasy novels as well as articles for national magazines and newspapers. She’s also an award-winning artist. The first book of a trilogy, Deception Peak is a young adult adventure fantasy about a teenager, Ian Wilson, who follows his father through a portal that magically appears on their computer screen. They travel into a deceptively beautiful Realm, where horses run free, the wind sings prophetic melodies, and their computer avatars come to life. But when the two are separated, Ian is abducted by a tribe of dragon worshipers and is forced to find his courage. As he struggles for his freedom and embarks on a perilous search to find his father, Ian meets the true peacekeepers of the Realm. It’s then that he learns there is a greater purpose for being there. Thanks for the post, Raven! 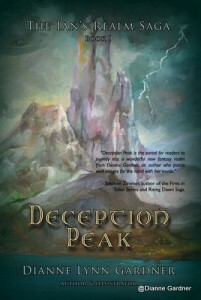 I will, in fact, have a work in progress post of the painting of the dragon on Gwen Perkin’s blog A Few Words tomorrow. Hope to see you there!